How do you rebuild your life after the loss of you husband and the father of you two young children? Business leader Sheryl Sandberg has no choice but to adjust to her option B life. 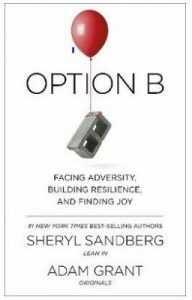 Whilst Sandberg draws from your own deeply personal experience, the book introduces a range of other issues in life that can cause us to have to look at an option B for our life. It addresses subjects like the role of friends and family, our own self-confidence, getting back into the workplace, and helping kids through the journey as well. Using solid well researched principles, the authors give the reader tools rather than a prescriptive approach to handle whatever life has thrown at you. This acknowledges that each situation is deeply personal and there is no “one-size-fits-all” approach. The book is well written, organised well and flows easily. It was very easy to read and challenged me in not only thinking about how to handle the difficult moments in life, but how to help other people handle theirs. I highly recommend this book, which although is not a standard management text, certainly is very important in slef0leadersherip. I believe it is important that everyone read this book. This entry was posted on Sunday, January 13, 2019 at 9:21 pm	and is filed under ABS News, Book Review, Experience. You can follow any responses to this entry through the RSS 2.0 feed. Both comments and pings are currently closed.